This week the National Institutes of Health, National Institute on Drug Abuse (NIDA) and groups across the nation will be working together to shatter the myths about drug use! About one third of high school seniors report having used illicit drugs in the past year (NIDA), most of them without even knowing how these drugs could affect their health, school performance, family relationships, and future success. Drug Facts Week represents a national effort to open up an honest conversation about the effects of drug use and abuse between experts and teens and offer important resources that are designed to help teens learn the facts and make more informed decisions. During the Third Annual National Drug Facts Week (January 27th - February 2nd) teens nationwide will participate in school events, resource fairs, and online chats focusing on the realities of drug use and abuse. Events are listed on the National Drug Facts week website at: http://teens.drugabuse.gov/ndfw/map. On Tuesday January 28th (8 AM-6 PM EST), NIDA will be hosting a Chat Day where teens can interact with experts and get their questions about drug use answered. To register for Chat Day visit: http://drugfactsweek.drugabuse.gov/chat/index.php. All week long, FOCUS will be posting resources about drug use and abuse as well as information to help parents and teens communicate about difficult issues on the FOCUS Facebook page. 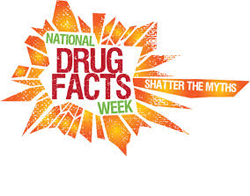 Also, be sure to check out these great Drug Facts Week Resources: http://drugfactsweek.drugabuse.gov/resources.php and this awesome list of DrugFacts: http://www.drugabuse.gov/publications/term/160/DrugFacts.